QUBEIBEH, West Bank (CNS) — The entrance into this small Palestinian village encircled by the Israeli security barrier and settlements is through a series of bleak and darkened underpasses. 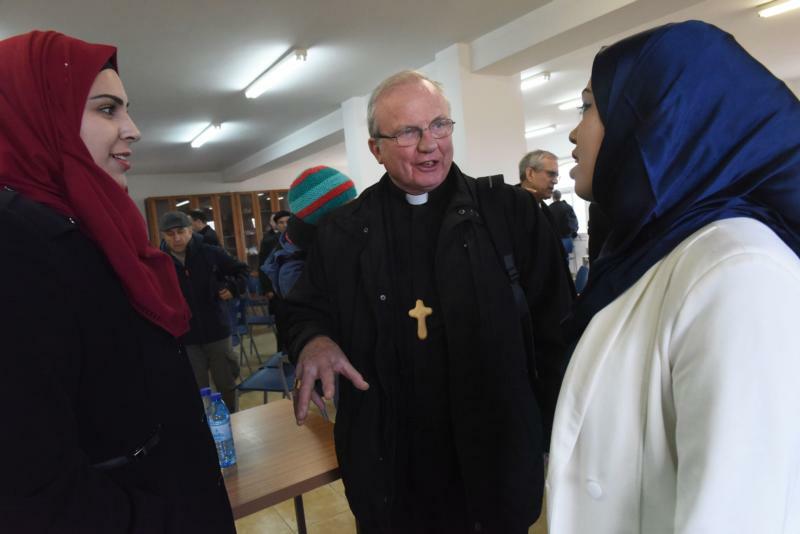 But bishops from three continents said their Jan. 17 meeting with students from the Bethlehem University nursing department satellite campus gave them a sense of hope. “Previously, we were at a Palestinian school, and they were not very hopeful for their future, but here they are coming to study, and they are getting jobs at the end, which means they will stay here, which is a good thing,” said Bishop William Nolan of Galloway, Scotland. The Qubeibeh Nursing Program is in its 10th year. One hundred students are enrolled in the program, which allows young people from the neighboring villages to study in the university’s academic program without having to make the circuitous and expensive trip through the settlements and checkpoints to Bethlehem, West Bank. The program provides job opportunities to its young graduates, who come mainly from rural areas with high levels of unemployment and social and political problems. About 95 percent of the program’s 111 graduates have found jobs in Jerusalem or Bethlehem hospitals. The bishops were part of the Holy Land Coordination, in which bishops from North America, Europe and South Africa meet with Israeli and Palestinian groups to promote dialogue and peace. This year the focus is on education and young people, and the importance of education for building peace in the region. The bishops also met with Salvatorian Sister Hildegard Enzenhofer, leader of Beit Emmaus Home for the elderly and disabled, where the nuns care for 34 women. Sister Enzenhofer spearheaded the establishment of the nursing program in the village, together with Qubeibeh resident and Bethlehem University graduate Usama Zahran and other supporters. Qubeibeh is one of four locations identified as the biblical Emmaus, where Jesus appeared to the two disciples Cleopas and Simeon. In addition to one Christian family still living in the village there are three communities of nuns and a Franciscan friar, caretaker of the Franciscan sanctuary. Because of the difficulty in reaching the place, most pilgrim groups no longer include Qubeibeh on their itinerary. But the foreign bishops visited as part of their efforts to hear concerns from Israelis and Palestinians. Speaking to young people from both sides has been a “real eye-opener,” said South African Archbishop Stephen Brislin of Cape Town. “Palestinians see a bleak future with a lack of opportunity and very high unemployment rate. I think Israeli young people quite often feel trapped. I don’t think they are happy with the situation, but are in a quandary about what they can do about it. Growing up in Israel must be quite stressful — it is a secure-ratic state,” said Archbishop Brislin. Bishop McKeown noted that, coming from an experience of contested shared space in Northern Ireland, 30 years ago he had not thought peace would come to Belfast or that the Berlin Wall would come down or apartheid would end in South Africa. But within a decade, all those things changed radically because “little people built little bridges,” he said. “I am hopeful if good little people … keep asking difficult questions … something will happen. The power of prayerful little people can make a difference,” he said.